This landed in my Inbox last week. 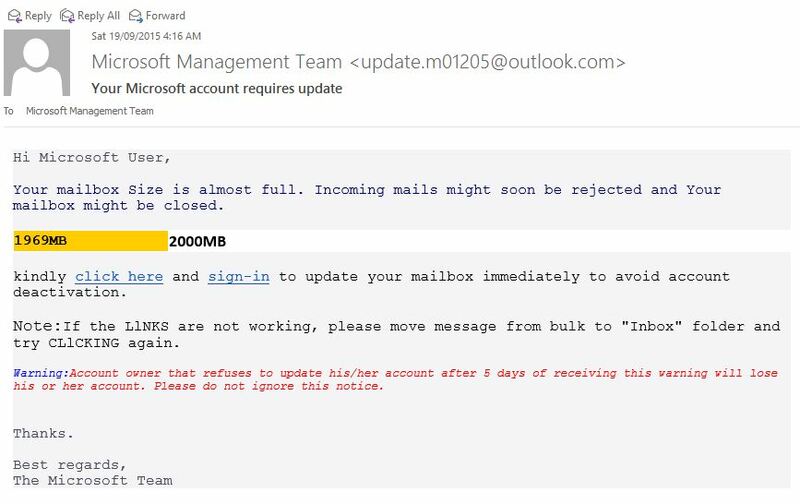 It’s a phishing scam, designed to capture your real login details and is definitely not from Microsoft. It’s good practice to log straight into the website or Cloud service in your web browser to check the validity of any warnings like these. Don’t click on links in your emails! Your mailbox Size is almost full. Incoming mails might soon be rejected and Your mailbox might be closed. kindly click here and sign-in to update your mailbox immediately to avoid account deactivation. Note:If the LlNKS are not working, please move message from bulk to “Inbox” folder and try CLlCKING again. Warning:Account owner that refuses to update his/her account after 5 days of receiving this warning will lose his or her account. Please do not ignore this notice. Prev Story Can’t create a static gateway VPN on a Microsoft Azure virtual network	Next Story The Internet of Things: Smart toasters, smart cities or dumb marketing?